Does the thought of roasting a turkey make you a bit nervous? 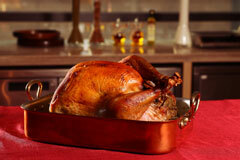 I've provided detailed directions in this recipe to help you roast a moist and delicious bird! Roasting a turkey really isn't all that hard. The trouble is that many people feel pressured to produce a perfectly browned bird, have it come out of the oven at just the right time, and have it be incredibly moist. That puts a lot of pressure on even the experienced home cook! This is how I cook a turkey. 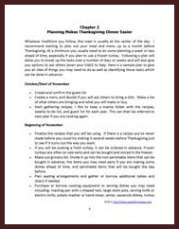 I've included detailed directions that covers everything from what to do with the giblets, how you should position the turkey in the roasting rack, and even how to use a baster! 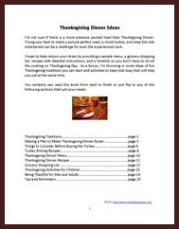 If you are cooking a full Thanksgiving style dinner and need a little more help than just a turkey recipe, see information on my Thanksgiving Dinner Ideas E-Book shown on the right. Preheat the oven to 325'F. Prepare the seasoned butter in one bowl and combine the basting sauce ingredients in a small saucepan. Oil a roasting rack and set it inside the roasting pan, near the sink. Gather several paper towels, a baster, pre-cut kitchen string, and disposable rubber gloves (if you prefer). Prepare the bird by removing the giblets, which may be in a small disposable bag inside the cavity of the bird. Rinse the inside and outside of the turkey with a low stream of cold water. Make sure that excess water is drained from both the neck cavity and the large inner cavity of the turkey. Place the drained turkey, breast side up, on the oiled rack in the roasting pan. Blot the inside and outside of the turkey with the paper towels. Using your hands (this is why the rubber gloves are helpful!) massage the seasoned butter mixture into the inside and outside of the bird. If you would like, you can place a peeled onion, several stalks of celery, a sprig of fresh sage, and a lemon inside the cavity of the turkey. tie the legs together and the wings down with kitchen string. Roast the turkey at 325'F for approximately 15 minutes per pound. While the turkey is roasting, simmer the basting sauce over low heat for 2-3 minutes, and then remove from the heat. While the turkey is roasting you can baste it occasionally with the melted basting butter, which can be reheated if necessary. If you've never used a baster before, go slowly so that the sauce doesn't spatter inside the oven! Once the outside of the turkey is a nice golden brown color, then lightly tent it with foil to prevent it from getting over brown. Use a meat thermometer, placed in the deepest part of the thigh to assure that the bird is fully cooked; 165'F. Even if your turkey comes with a pop up timer, it's recommended to also use a meat thermometer. Once done, remove the turkey from the oven and let it sit on the counter, tented with foil, for about 20 minutes before carving. If you want to take the stress out of Thanksgiving, this e-book can help! 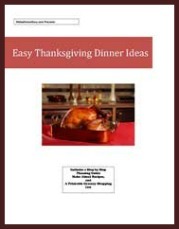 This 33 page e-book is a comprehensive guide to making a delicious Thanksgiving dinner with the least amount of stress. Following your purchase you will receive an e-mail with a link you can open and print this e-book right away. No waiting to go to the bookstore, no waiting for the mail to come. On page 3 of this book you will find a Table of Contents to make referencing the sections of this book easier. On pages 6-8 you will find a breakdown of activities you can complete in advance so that you don't leave all the planning to the last minute. I even provide a day by day breakdown of what you can do the week of Thanksgiving to get everything done with as little stress as possible. 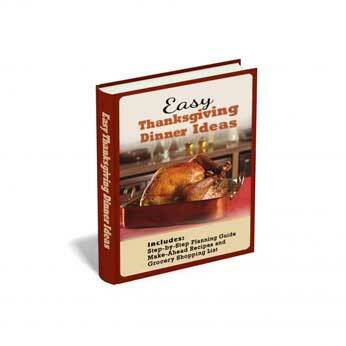 Included in this e-book are all the recipes you need to make a delicious Thanksgiving Dinner. 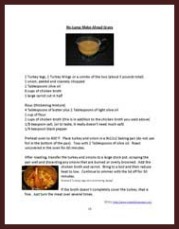 Many of the recipe pages, such as this page for a make ahead/no-lump gravy, include detailed directions and photos to guide you to what the finished dish can look like. I don't care to cook with a lot of processed ingredients so you won't find recipes that rely on those in this e-book. This is real, made from scratch, cooking with wholesome ingredients. Just like I do for my weekly menus on Make Dinner Easy , I have included in this e-book a one-page grocery shopping list that is organized by aisle and cross-referenced by recipe. That way if you want to add your own side dish or dessert recipe to the menu it is easy to modify the grocery shopping list that I have provided. I've also included an extra copy of this grocery list for you to use the next time you make a traditional turkey dinner.